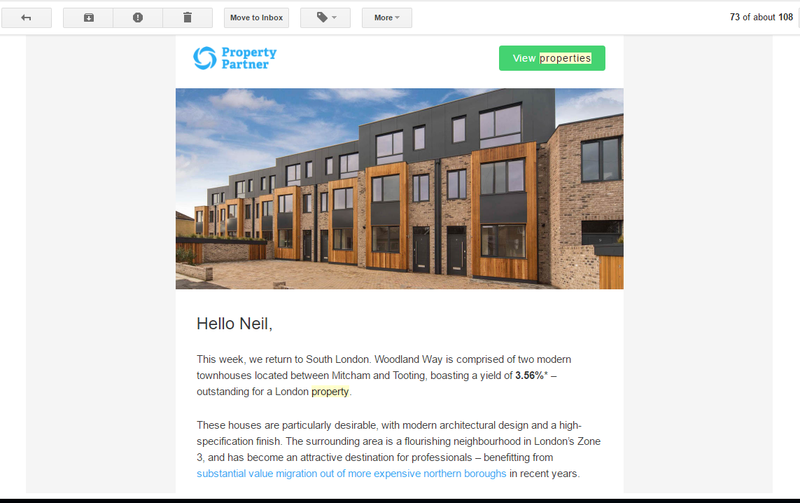 Property Partner is the UK’s largest Property Crowdfunding Platform with over £50 million invested to date (versus ~£10 million Property Moose or ~£43 million on The House Crowd). I’ve been investing with them since July 2016: so perfect timing to report on performance amidst the post-Brexit property gloom. I’ve also used The House Crowd and Property Moose, so this review is based on my experience in relation to the others too. Property Crowdfunding platforms allow investors to buy shares in property investments and benefit from ongoing rental income and house price increases. Properties are held within an SPV (Special Purpose Vehicle) which is a specially created UK LTD company to hold the asset. Expected Returns: ‘over 7%’ made up of approx. 3% net rental yield and 4% capital appreciation (Property Partner’s figures, not mine). Sell Out: Yes, active secondary market with bids & offers. No fees to sell but 2% fee + 0.5% stamp duty to buy. Cashback: £50 if you invest £1000 via a refer a friend offer (more info here). Before Brexit, Property Partner focused mainly on properties in the South East/ London. These investments came with lower rental yields but higher expectations of capital growth. Directly after Brexit you could see that they paused new investments for a few months, reconsidered their strategy and started to offer more Midlands/Northern investments with higher yields. Worth £900,000 but with a mortgage on 50%, so raising around £450,000. Mortgage interest rates often under 4%. Note this is just a rough example of the types of deals they offer, it’s what pops into my head when I see an new investment email! Fees given to the best of my knowledge as of 11th April 2017, with no clear data for The House Crowd. Please confirm with individual platforms before making an investment. The 0% exit fee, which would be applied if they sell the property at a profit at the end of the investment period, is appealing. Property Partner probably has the lowest fees of the main property crowdfunding platforms. From memory they close bidding periods at 10am on Wednesdays. If it’s oversubscribed (more bids than availability) they give you a % of your bid and refund the remainder. If it’s undersubscribed they release it alongside the secondary market loans for general availability to purchase at the original price. You have to deposit money to make a pre-bid. Once it’s funded it’s usually a few weeks before it becomes available to sell on the secondary market. Sometimes it’s longer, I think if the official purchase paperwork drags on. Property Partner: ‘Over 7% estimated returns’ going forward, estimated 8.6% annualised historic return up to March 31st 2017 (made up of 3.2% rental income & 5.4% capital value growth). Property Partner work on 5 year terms and in my opinion these investments should be regarded as long term. Property Partner have a nice secondary market that allows bids/offers and has some charts on the side of each investment. There’s no fees to sell, but you pay 2% transaction fee + 0.5% stamp duty to buy. One of the founders of Betfair, a very popular gambling exchange, is a non-executive director and the Property Partner Chief Operating Officer (COO) also worked for Betfair and in sports betting. I’ve used Betfair in the past and I can see how that would influence them to create a similar trading platform at Property Partner. Property Partner pride themselves on their open data. Each month they release data in their ‘open house’ reports, here is a link to the one from February 2017. 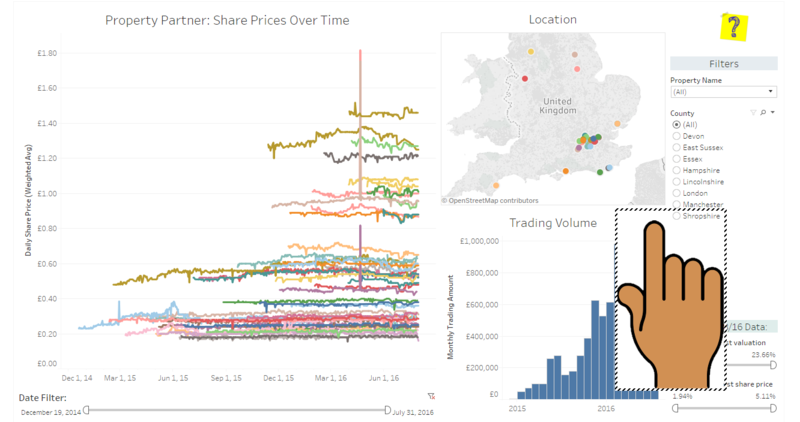 You’ll find some nice looking charts and a link to download a csv of secondary market data. Read more about how this was calculated. In the end I didn’t find anything that would give me a great advantage: the total cost to buy at 2.5% outweighs any opportunities (in my personal opinion). Secondary Market volume is high for a P2P platform but nothing compared to something like Betfair. As you may be aware the government are changing the way private buy-to-let (BTL) properties are taxed, reducing the tax relief from mortgage interest. This makes traditional BTL for a small time investor less appealing and crowd-to-let platforms like Property Partner may be able to fill the gap. Property Partner have to pay stamp duty on purchase but as the property is in an SPV they are able to claim relief on the mortgage income. A second change in the March 2017 budget was to the tax free dividend limit, from £5,000 to just £2,000. Property Partner pays out the ongoing rental income in dividends, so there is now less capacity to receive these tax free. Beyond the tax free dividend threshold, investors will have to pay 7.5%, 32.5% or 38.1% depending on their tax band (Basic, Higher, Upper). Yes, absolutely. However, it is your responsibility to satisfy yourself that an investment through Property Partner complies with and is permitted under the laws of your jurisdiction. This includes complying with any governmental or regulatory requirements or other applicable formalities. Unfortunately, we don’t currently accept investors based in the US. You can use a low-cost money transfer service to send money across, I wrote up a comparison of money transfer services targeted at GBP->EUR but it’s useful the other way around too. 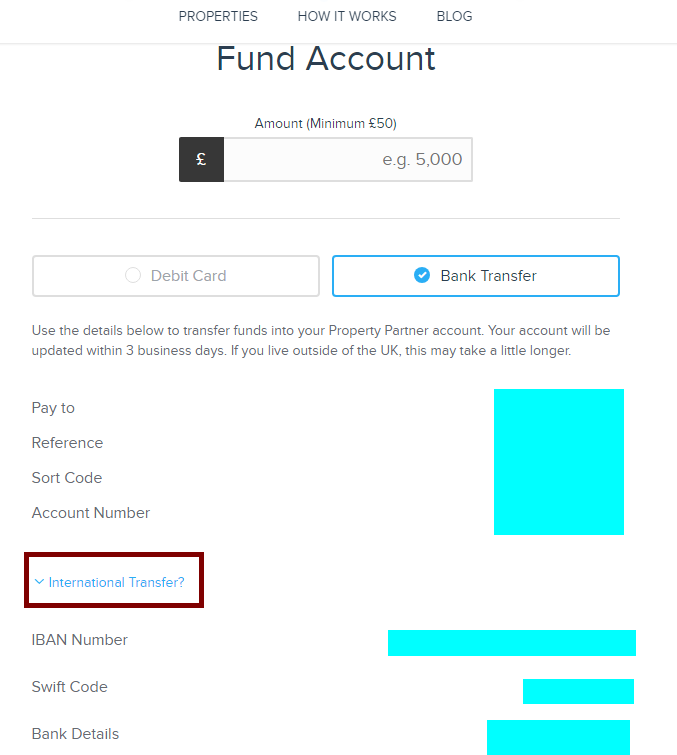 Property Partner are running a £50 cashback via refer a friend, and CurrencyFair are running a similar thing for €45 cashback on a €1,000 transfer – so potentially you could have ~€100 in bonuses to invest ~€1150. Property Partner has a wide range of property investments and a well-oiled secondary market so you can build a diversified property portfolio on Day-1. The fees are lower and more transparent than some of its competitors. With the open data you can do additional analysis to spot trends and build confidence. In my opinion Property Partner is a longer term investment, especially when you factor in transaction fees to buy. There is some uncertainty over the future of the UK’s property market and as many investments are leveraged 50% with a mortgage you are more exposed to house price falls than a straight forward un-mortgaged investment. Nevertheless, they are the largest property crowdfunding platform, have the best technical platform (in my opinion) and are strong contenders for a place in a diversified investment portfolio. The £50 new customer bonus via a refer a friend is a nice sweetener too, see here if you need a friend! When I look on the Property Moose website they describe a 5% upfront fee on investments which is higher than the Property Partner upfront fee. Property Moose price the upfront fees for primary market purchases into the SPV, so if I buy a primary market share at £10 and resell at £10 a month later I break even. 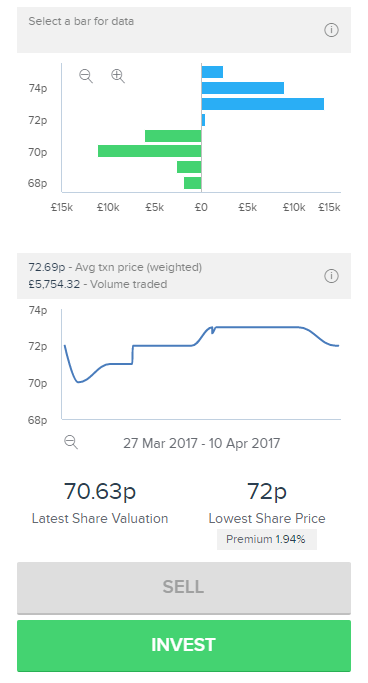 If I did the same on Property Partner I’d pay the 2.5% when I buy (outside the SPV) and would have to sell at a 2.5% premium just to get the initial money back. In both cases the buyer on the secondary market would have to pay an additional 2% or 2.5% to my sale price. Great article and just what I was looking for. Thank you very much. I’ve found Property Partner excellent so far and as a long term investor looking for some diversification I think Property Partner it is a no brainer. Fingers crossed I still feel the same in 5 years!